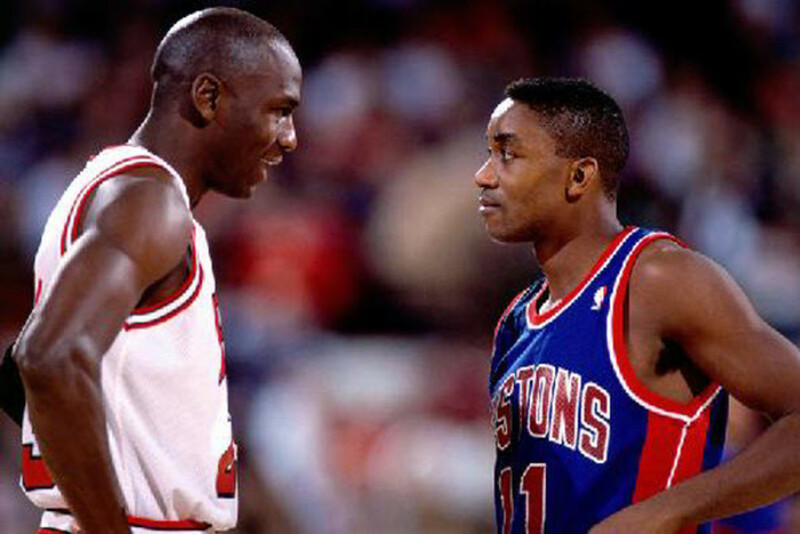 Isiah Thomas was not afraid to go toe-to-toe with the great Michael Jordan. Isiah Thomas was a star long before he even stepped foot into an NBA arena. He was the star player for Bob Knight and the Indiana Hoosiers and helped lead them to the 1981 NCAA Championship. Despite his diminutive size, Isiah was a bulldog who never backed down from anybody. He truly epitomized the saying that it is not the size of the dog in the fight but the size of the fight in the dog. 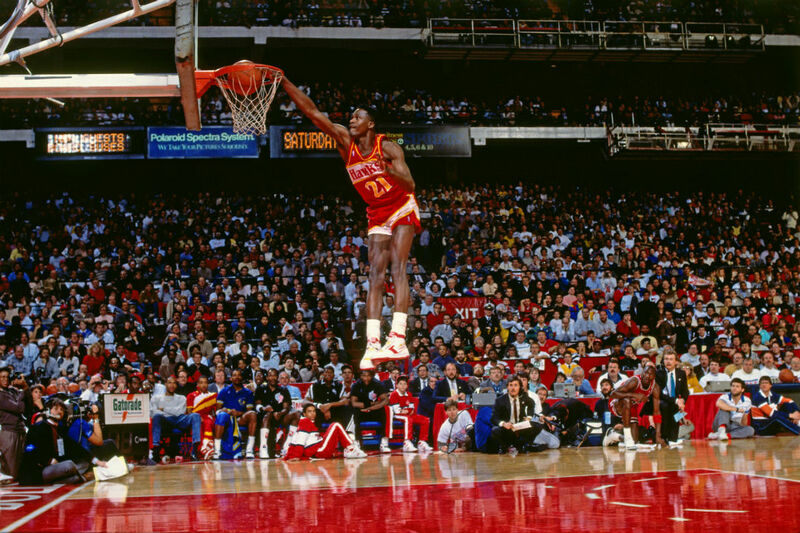 Isiah brought his fearless style of play to the NBA when he became the ringleader for the "Bad Boys" Detroit Pistons. The Pistons were not about polish and finesse. They were about the grit and grind. They were the epitome of basketbrawl. Whether it was Bill Laimbeer squaring off with Larry Bird or Dennis Rodman getting it on with Michael Jordan, the Pistons were one of the most hated teams in the league for their rough style of play. The team served as the bully of the NBA. Among their victims were Michael Jordan and the Chicago Bulls. They tormented Chicago and trounced them from the playoffs year after year. The Detroit Pistons seemed to be the big dog in the NBA yard. Not even the mighty Michael Jordan could stop them. Not only were the Bulls and Pistons playoff rivals, but there had also been reports of a freeze-out happening during Jordan's first All-Star game. It has been reported that Thomas instigated the freeze-out since he felt that Jordan was stealing the spotlight from veterans such as him. Though Thomas vehemently denied this, rumors of this persist to this day. Finally, in the 1990–91 season, the Bulls had a breakthrough. Scottie Pippen and Horace Grant emerged as All-Star-caliber players and the Bulls swept the Pistons in the Eastern Conference Finals. There was so much bad blood between the two teams that the Pistons walked out of Game 4 with time remaining in the clock without even congratulating the Bulls. This would not be the end of it though. Jordan blackballed Isiah from being part of the first Dream Team. He gave the ultimatum that it was either him or Isiah. 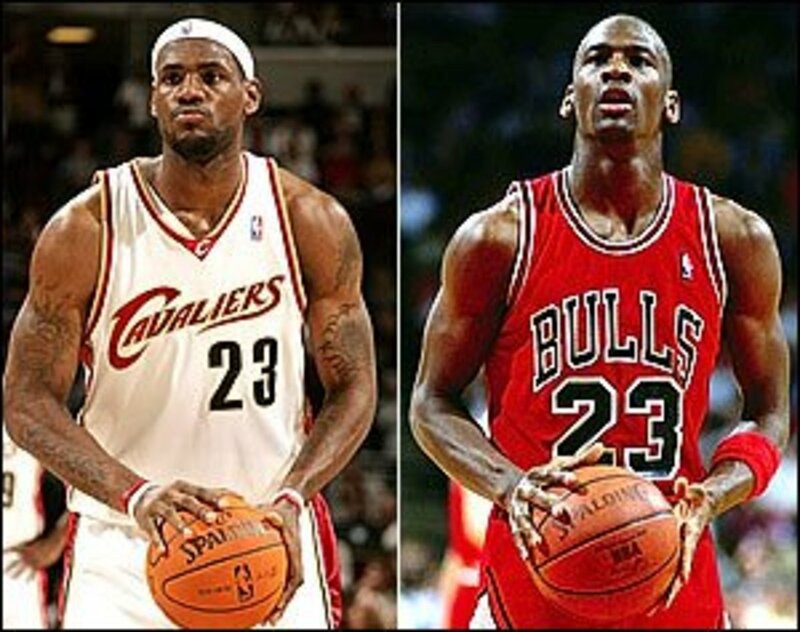 Of course, as Jordan was the NBA's golden boy, they chose him over the aging Thomas. Jordan would confirm this 20 years after the fact in a documentary done by NBA TV. Overall, Isiah had a remarkable 13-year career with the Detroit Pistons. He is a two-time NBA champion, one-time NBA Finals MVP, 12-time NBA All-Star, two-time NBA All-Star Game MVP, and three-time All-NBA First Team member. Dominique Wilkins entertained many fans with his high-flying antics through his nearly two-decade career. Dominique Wilkins is known as The Human Highlight Film. He is a showman of the highest order. His aerial acrobatics and gravity-defying dunks wowed crowds of basketball fans for almost two decades. He is a two-time NBA Slam Dunk champion who could have easily won it four times if not for the controversial decisions in the final round of two of the contests that gave the title to Spud Webb and Michael Jordan. Though not a marksman from the three-point line, Wilkins was a flashy scorer who averaged 24.8 PPG through his career. He is the 13th leading scorer in NBA history with 26,668 points. He attacked the basket with impunity during his career and was also a decent mid-range player. The rivalry that started in the NBA Slam Dunk contest ended in the playoffs where the Chicago Bulls thoroughly dismantled the Atlanta Hawks 3-0 in the first round of the 1993 playoffs. Wilkins scored 24 points in Game 1, 37 points in Game 2, and 29 points in Game 3. Despite his best efforts, the rest of the Hawks could not match the production of their Chicago counterparts. Though Wilkins was one of the more prominent players during the Jordan era, he never got far into the playoffs. The farthest he reached was the Eastern Conference Semifinals. However, he did lead his team to the 1996 FIBA EuroLeague Championship. He did so with averages of 20.1 PPG, 7.4 RPG, and 1.8 APG. Dominique's various achievements include being a one-time scoring champion, two-time NBA All-Star Slam Dunk Champion, nine-time NBA All-Star, and being inducted to the Naismith Memorial Basketball Hall of Fame in 2006. It appears that basketball runs in the blood of the Wilkins family. His younger brother Gerald played in the league for 13 seasons and his nephew, Damien Wilkins, played in the league for nine seasons. Though not as spectacular as Dominique, Gerald was a decent scorer and a defensive stopper. He was oftentimes tasked to defend the league's most potent scorers and this included Michael Jordan. Damien, on the other hand, was a key rotation piece for half a dozen NBA teams during his time in the league. Clyde Drexler and Michael Jordan faced off in the 1992 NBA Finals. If history were a bit different, this rivalry would not even exist. You see, the Blazers held the second pick overall by virtue of a trade with the Indiana Pacers. They traded Tom Owens on June 5, 1981 for the Pacers' first-round pick in 1984. They could have used the pick to draft Michael Jordan. With Michael running the point and Clyde at shooting guard, the Blazers would have had one of the best back courts of all time. Instead, they wasted the pick on a talented yet oft-injured Sam Bowie out of the University of Kentucky. Jordan and Drexler were often compared to each other because of their aerial acrobatics. Both had great athleticism and amazing leaping abilities. They also had very similar heights and builds. They were also good mid-range shooters. During the eighties and early nineties, the league had some elite shooting guards such as Reggie Miller, Mitch Richmond, Chirs Mullin, Joe Dumars, and Glen Rice. Michael always had to perform during these match-ups to silence the critics but the nearest comparison to him during this era was Drexler. He was not spectacular as a rookie as he played off the bench most of the season. However, he did manage to muster a respectable average of 7.7 PPG, 2.9 RPG, 1.9 APG, and 1.3 SPG in just 17.2 minutes per game. Clyde had his breakout season in his sophomore year where he nearly doubled his minutes at 31.9 per game. This increased his production with improved averages of 17.2 PPG, 6 RPG, 5.5 APG, and 2.2 SPG. Clyde was the heart and soul of the Hawks for a decade until the 1994-95 season when he was traded to the Houston Rockets for Otis Thorpe. This united Drexler with his former college teammate Hakeem Olajuwon. The two led the Rockets to one of the most improbable championship runs in NBA history. 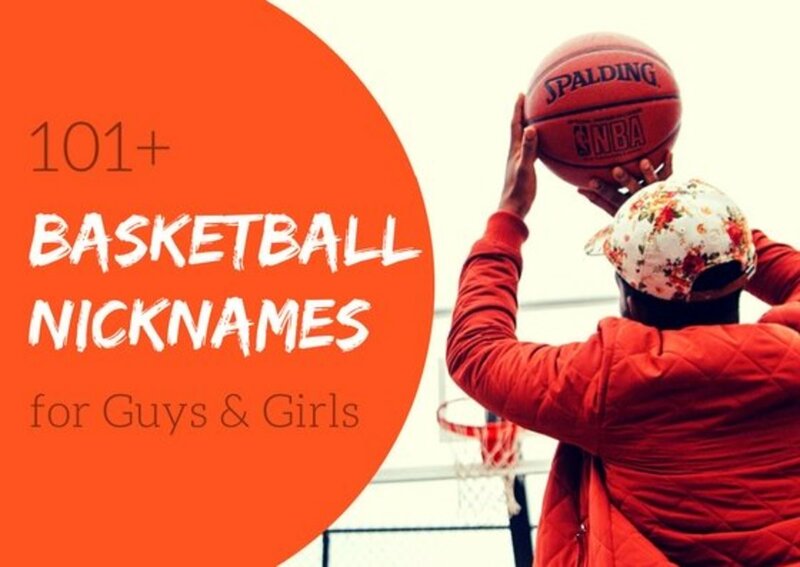 From the sixth seed, they battled four elite teams—the Utah Jazz (led by John Stockton and Karl Malone), the Phoenix Suns (led by Charles Barkley and Kevin Johnson), the San Antonio Spurs (led by David Robinson, Sean Elliot, and Dennis Rodman), and the Orlando Magic (led By Shaquille O' Neil, Anfernee Hardaway, and Horace Grant) to capture the Rockets second straight title. 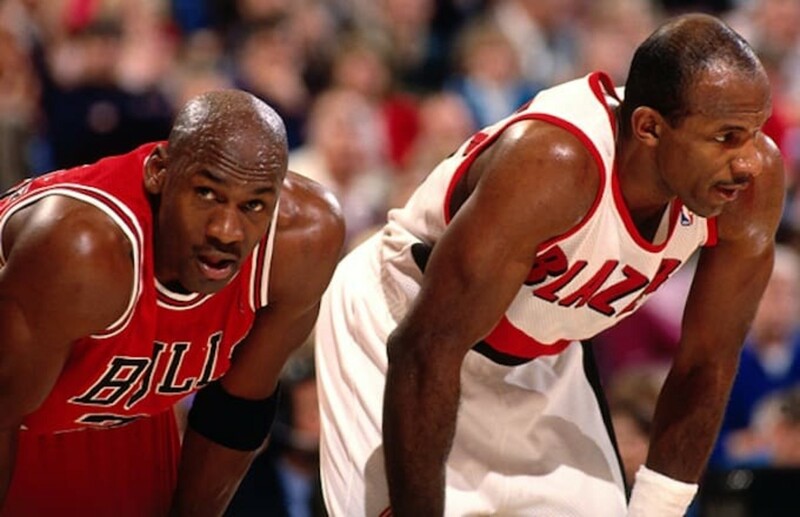 The Jordan-Drexler rivalry culminated in the 1992 NBA Finals when the Chicago Bulls faced the Portland Trailblazers. Michael was determined to prove who the best shooting guard was in the NBA and this led to a lot of memorable moments. This included a game where Jordan did his best Reggie Miller impersonation in Game 1 by dropping six three-pointers in the first half and then shrugging. 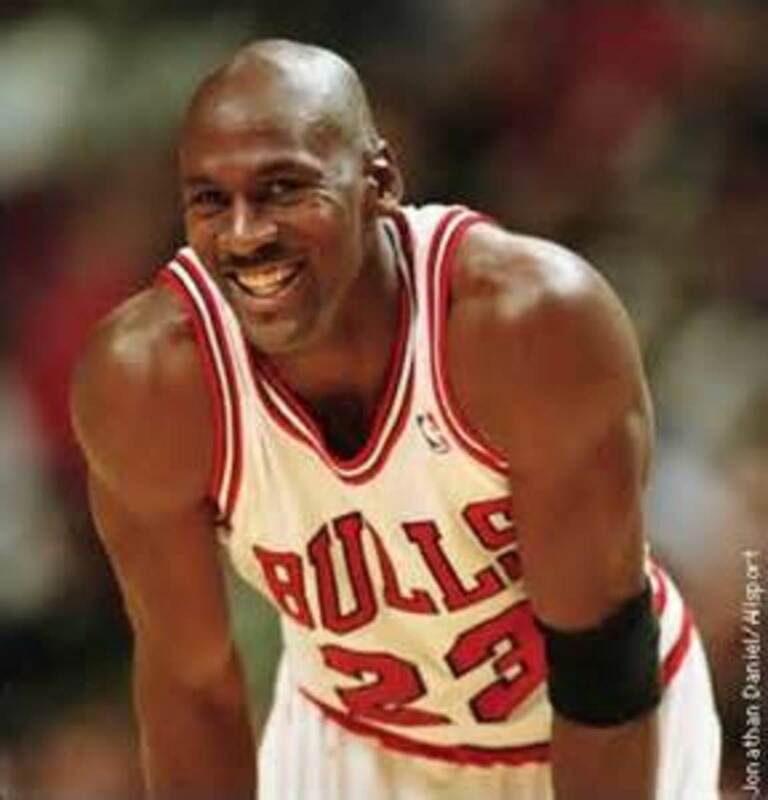 Jordan was not a known marksman from the three-point line so such a feat amazed even himself. The rivalry between the two premier shooting guards was captured in the video game Bulls vs. Blazers and the NBA Playoffs by Electronic Arts. 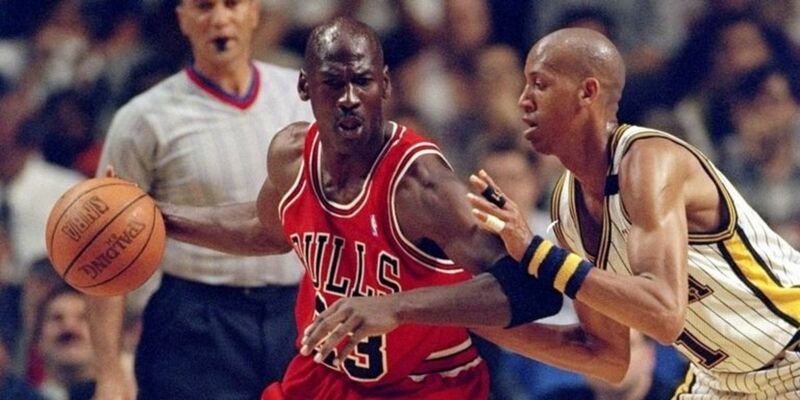 Reggie Miller has squared off with Michael Jordan multiple times in both the regular and post-season. Reggie Miller was the Steph Curry of his era. During a time when the league did not put emphasis on the three-point shot as it does now, Miller was the king of the three-pointer. No lead was safe so long as Reggie had the ball. With a split second, this deadly sniper could send the game into overtime or win the game altogether. During Reggie's prime, he was competing with Jordan for supremacy. The Pacers were quite good during Reggie's time as they were a perennial playoff team. Reggie played together with many notable players such as Chuck Person, Detlef Schrempf, Mark Jackson, Rik Smits, Dale Davis, Antonio Davis, Jermaine O' Neil, Ron Artest, Jalen Rose, Chris Mullin, and Brad Miller. The Bulls and Pacers matches during the Miller era were always a treat to watch as a lot of these games were close and there was a genuine rivalry between Jordan and Miller. What made this rivalry interesting was that both stars were big-time trash talkers. You can see both Reggie and Michael jaw jacking the whole game. The Pacers were a team that was custom built to beat the Chicago Bulls. The team boasted an excellent interior presence with the likes of Rik Smits and the Davis brothers as well as the sharp shooting of Chris Mullin, Reggie Miller, and Mark Jackson. This made every Bulls-Pacers game a dogfight. One of the more infamous Jordan-Miller encounters happened on February 12, 1993. Jordan sucker punched Miller and a shoving match ensued. Miller was thrown out of the game and fined $6000 but Jordan was not given a foul or thrown out. Miller was up in arms over this and claimed that there was a double standard in the league as Jordan was their golden boy. This led to Jordan being suspended a game versus the New York Knicks and a fine of $10,000. To quote Rod Thorn, NBA Vice President of Operations, "Michael threw a punch that connected and that's an automatic one-game suspension. In looking at tapes, in my mind, Michael was the aggressor in the whole incident." The rivalry culminated in an epic seven-game series in the 1998 NBA Playoffs. Miller sunk a clutch three-pointer over Jordan to stave off elimination in Indianapolis and bring the series back to Chicago for Game 7. Jordan retaliated in Game 7 and held Miller scoreless in the 4th quarter. He essentially shut down Millertime. Through his storied career, Miller averaged 18.2 PPG and scored a total of 25,279 points (14th on all-time scoring list). He was a marksman who shot an average of .471 from the field, .395 from the three-point range, and .888 from the free throw line. Larry Bird and Michael Jordan were great Eastern Conference rivals. Larry Bird is one of the greatest players to ever set foot on a basketball court. He may not have been the strongest, fastest, or most athletic, but he was one of the smartest. A cerebral assassin on the court, Larry would break players on a nightly basis. He would tell you exactly what he would do to you and there was nothing you could do to stop him. He was a cold-blooded assassin. Larry's beginnings started in the cornfields of Indiana. Kids there shot hoops for fun. Larry was among those kids who did not do it for fame and glory but simply for the love of the game. He grew up in an environment of extreme poverty. His dad, Joe Bird, was an alcoholic so his mom was left to basically support the family of six children through two jobs. Joe never recovered from his Vietnam War experience and most likely suffered from PTSD. He later committed suicide. Despite tragedy and hardship, Larry focused on honing his basketball skills. His efforts culminated in one of the greatest NCAA games in history. He led the Indiana State Sycamores against the Magic Johnson-led Michigan State University Spartans. The Sycamores fell 75-64 against the talented Spartans but they were previously undefeated (33-0) before that. Larry and Magic went on to dominate the NBA after college. However, there was a new sheriff in town—Michael Jordan. Michael averaged 28.2 points per game right out of the gate and soon became a household name. With his aerial acrobatics and showmanship, Michael quickly became a crowd favorite. Not only was he appreciated by the hometown Chicago fans, he was adored by fans of the opposing teams. The match people wanted to see was the old guard versus the new guard. They wanted to see Jordan versus Bird. 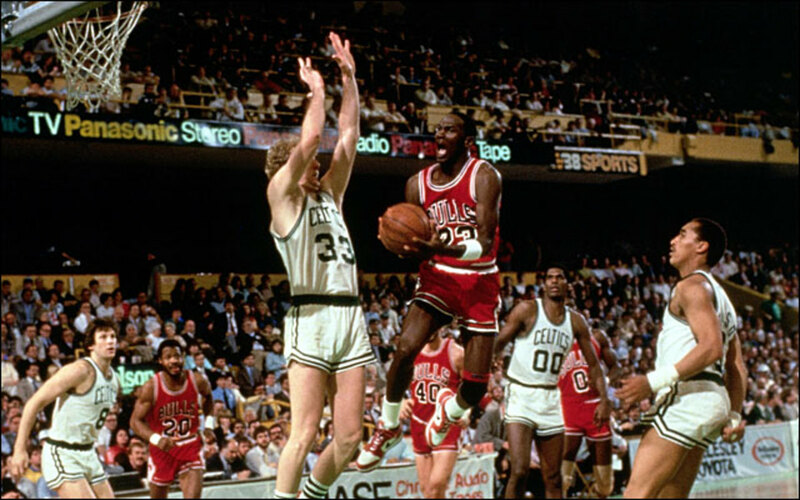 The fans got what they wanted in the first round of the 1985-86 post-season when the first seeded Boston Celtics faced the eighth-seeded Chicago Bulls. The Celtics were star-studded with Larry Bird, Kevin McHale, Robert Parish, and Bill Walton in the front court and Dennis Johnson and Danny Ainge in the back court. Jordan on the other hand only had a young Charles Oakley and an over-the-hill George Gervin to compliment him. 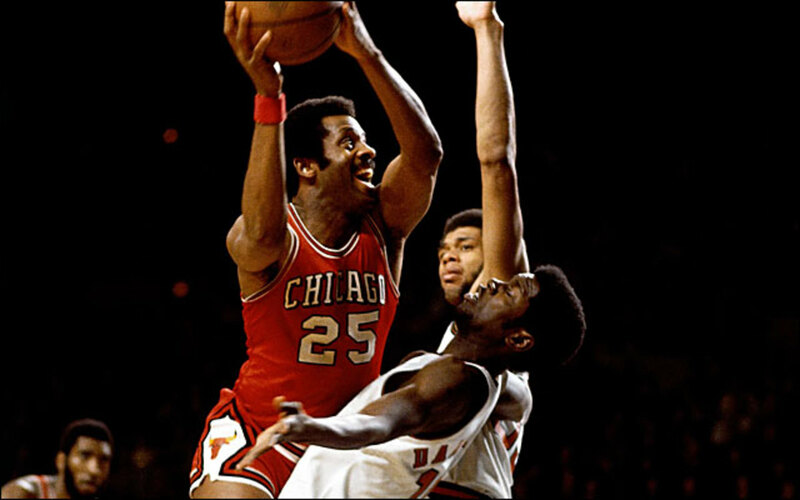 He also missed most of the 1985–86 season due to injuries but the Bulls were able to make it to the playoffs despite a 30-52 record. Jordan did his best against the Celtics juggernaut and scored 49 points in Game 1, 63 in Game 2, and a near triple-double of 19 points, 10 rebounds, and 9 assists in Game 3. However, the Celtics were just too deep and too talented for even the mighty MJ to overcome. Despite the Bulls falling in three games, Bird gained a newfound respect for Jordan. He said, "I didn't think anyone was capable of doing what Michael has done to us. He is the most exciting, awesome player in the game today. I think it's just God disguised as Michael Jordan." The Jordan-Bird rivalry would spill into many regular season games and a rematch in the 1986-87 postseason where the mighty Celtics would once again sweep the underdog Chicago Bulls. A McDonald's commercial even showed a tongue-in-cheek perspective into the Jordan-Bird rivalry by having the two players compete in a shootout for a Big Mac and fries. A video game entitled Jordan vs Bird: One on One was also made by Milton Bradley and Electronic Arts. It highlighted the rivalry by letting players pick Jordan or Bird in a one-on-one match-up. The game also had mini-games where you can be Jordan in a slam dunk contest or Bird in a three-point contest. Why didn't you include Hakeem Olajuwon as a rival to Michael Jordan? Magic was a friend of Michael's, and there wasn't any bad blood between them. Besides, there wasn't any comparison between Michael and Magic.